Internet people are reading a lot into this photo. Why? I guess folks are thinking Ep 3 will be released for Christmas? I really hate the gaming questions. Gabe Newell (Gaben) with a beard. Parsifal ..the opera Wagner took 25 years to finish.. lots of discussions about it around… guess that’s the reason..
Third act of Parsifal was written 25 years after the first one. 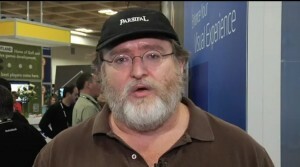 Gabe Newell. Half Life 3 release (or not).